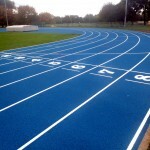 We offer athletics track cleaning services for many different types of sports facilities. This is often carried out at sports clubs and schools to remove dirt from the surface and make sure the flooring is in top condition. 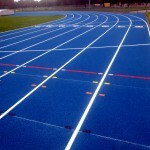 We’ll apply a jet wash to the area and brush away and debris which could get stuck in the pores of the track. Doing this helps to prevent issues with contamination and moss growth on the flooring, ensuring that it remains porous and doesn’t get slippery. Please fill in our contact form to speak with an expert about prices for carrying out a thorough clean of your sport surface. The process may vary slightly depending on the type of facility you have and what needs to be done. If you can include as many details as possible in your enquiry then this will help us to give you a more accurate quote for the work. 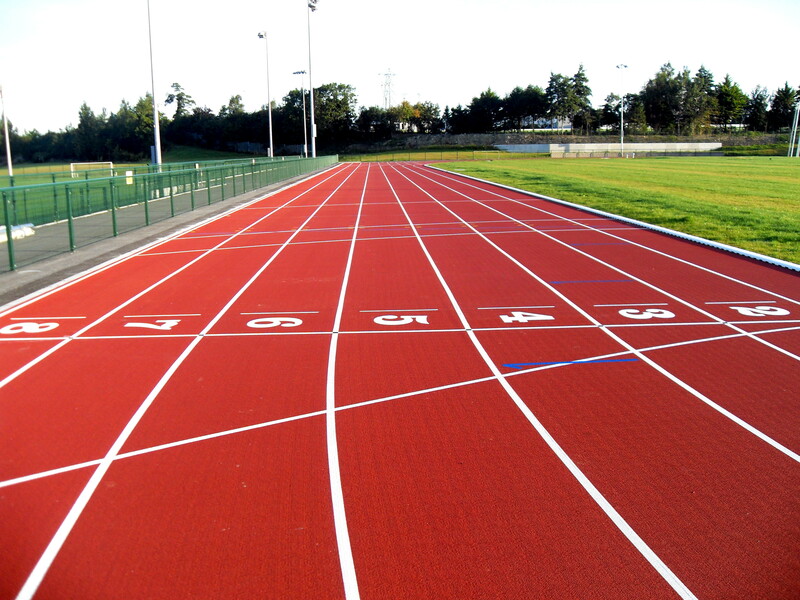 When you have a brand new athletics facility installed, you need to make sure that the specialist surfacing is looked after properly so you can be confident that you’ll get the best performance qualities from the sports facility. 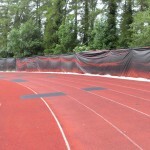 Depending on the type of surface you have installed, there are different methods of athletics track cleaning and maintenance which can be used to take care of the facility, whether it’s a full running track, long jump runway or high jump fan. 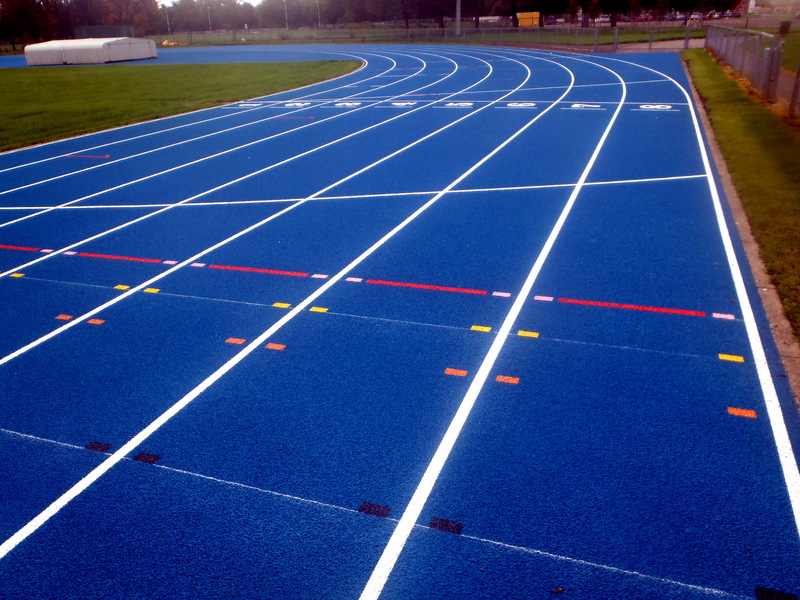 Polymeric Rubber Track – This EPDM athletics flooring type is a hard porous surface which is extremely versatile and allows water to drain through it quickly and easily, therefore allowing sporting events and training to carry on in wet weather. Athletics surface cleaning for this polymeric surface can include regular light pressure washing and brushing to remove fallen debris such as leaves and litter to prevent them from contaminating the area. Chemical moss and algae treatments can also be applied as a preventative measure to stop contamination and maintain the porosity and safety of the surfacing. Needlepunch Synthetic Track – This is a synthetic turf sport surface type which is also porous and extremely durable and can be used for many different activities. The needlepunch specification is installed like a carpet with a layer of sand infill between the fibres to enhance performance. Athletics track cleaning methods for this artificial grass system include drag brushing to spread the sand infill evenly throughout the pile and to remove dirt, as well as chemical treatments to stop contamination from algae and moss. 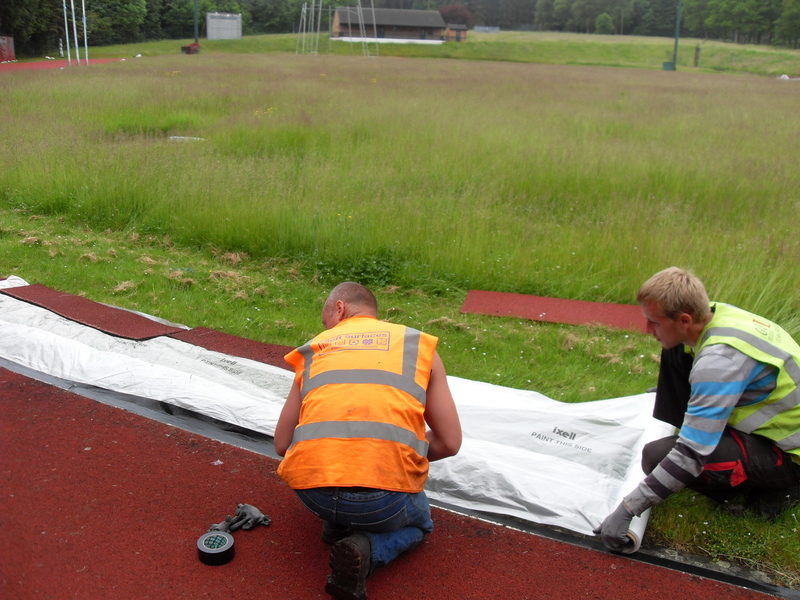 As specialist athletics facility contractors, we can also provide a number of services in regards to athletics surface maintenance to help you keep your facility working well and free from flooding and contamination. 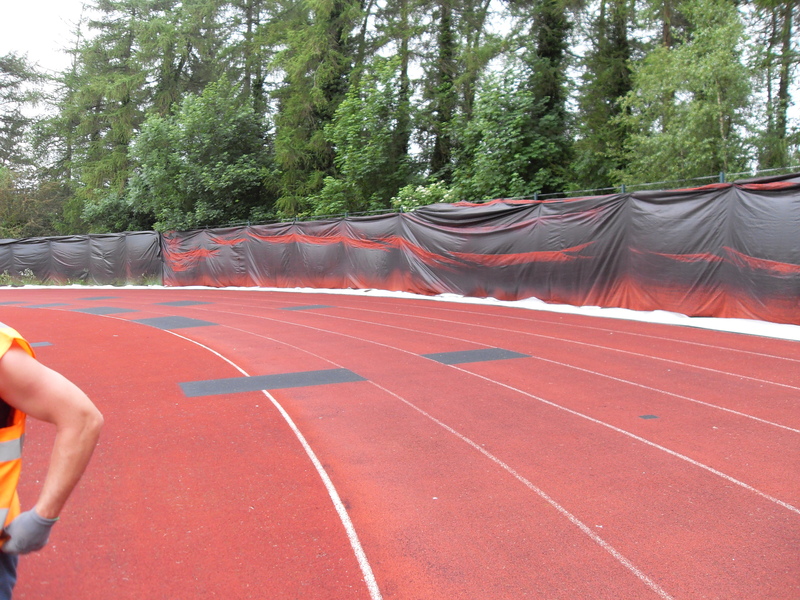 We would be happy to offer advice for how you can look after the athletics surfacing yourself by preventing damage and weathering as much as possible through regular cleaning. Our athletics surface maintenance services also include repairs to damaged areas, rejuvenation of sand infill for needlepunch systems, and full resurfacing projects for surfaces which has fallen into extreme disrepair and cannot be fixed by any other means. We’ll be able to recommend the best course of action for your facility to get it back in top condition if it has suffered damage. 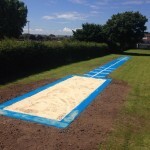 Flexible quotes and costs can be provided for our wide range of athletics surface maintenance and construction services, each quotation will be tailored to the particular works and every project has its own individual variables which affect the costs. Factors such as the nature of works, the area size of the facility, project location and access to site will all have an effect on our prices for carrying out the job. 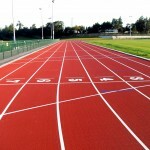 We aim to give each customer a personalised, good value service and we would be happy to discuss any enquiry you have regarding athletics track cleaning or installation. Please use our contact form to send us the details of your particular project and a member of our friendly staff will be able to offer you some professional advice. Try to include as much detail as possible about your project, such as the area size, location and existing ground conditions along with some photos. With this we can get the most accurate quote which will be best suited to your budget and cover every variable.